Then we moved. 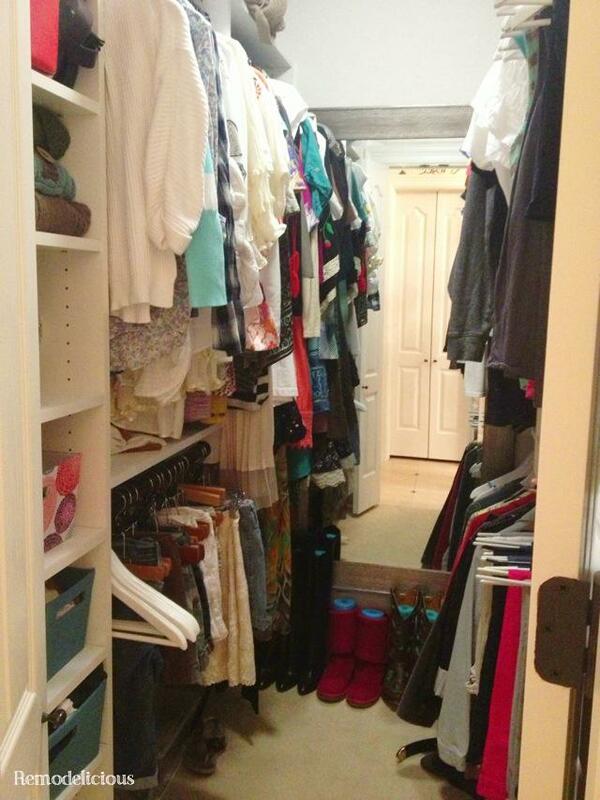 I had to forgive the house for its lack of amazing closets because it had so many other things going for it. I did my best to deal with it, but I really couldn’t stand to be in there because its so narrow that it felt like the room was closing in on me. The clothes are so close together that its difficult to even walk through. For someone who enjoys fashion and clothes, this just wasn’t okay. I found myself living out of a laundry basket instead of my closet. Then, finally, long after moving my prized shoes out of the closet and into an antique bookcase (more on that soon), I tackled the issue with an obvious solution: an oversized mirror. I was in the market for a full length mirror anyway (since my old closet had one built it), so a trip to Home Goods saved the day. I actually had a “normal” sized full-length mirror in the cart, but put it back in favor of this more dramatic, oversized one. It’s no Lisa Vanderpump dream closet, but at least it’s not contributing any unnecessary anxiety to my life, everything has a safe place to be stored, and I can find what I’m looking for. And, it was a little weird that friends came over and went straight to my closet to hang out. Now it’s all business, and I can accomplish what I need to in the little time that two toddlers allow me. I’d take the pool over the old closet any day, anyway. I’m only a little tempted to pop the ceiling and make it 2-story ;-).